Open standards have long been a major boon to information technology users because of the many benefits they confer: Interchangability, economies of scale, interoperability, efficiency, open markets, and avoidance of lock-in. The list goes on and has led to countless success stories and even the creation of entire industries. Not coincidentally, open standards have also been absolutely instrumental to the success of the Internet itself, making it possible for you to read this very piece on any device of your own choosing, running any operating system, any browser, on any network connected to the Internet. As long as they follow the open standards that underpin the Web, that is. I’ve long been following the story of open standards and social media, one of the most meandering standardization stories I’m aware of, from early initiatives like DataPortability.org and OpenID to the raft of social standards contenders that had emerged by 2010. The reasons for this are varied, but basically boil down to the highly competitive nature of the big public social networks, a poor understanding of the utility of IT standards by many enterprise social media practitioners, and frankly, a limited comprehension by the industry of what we actually needed in the early years. If this is so great — and it’s hard to argue a convincing countercase — then why hasn’t it happened? As I pointed out earlier this week, companies already feel like social media is steadily encircling them, service by service, app by app. But making this rapidly growing portfolio of social tools talk together, securing them, and ensuring they are compliant with global regulations and laws is extremely challenging. In other words, social media needs to be a single medium that can be treated one way for all our concerns, not an increasingly fragmented collection of them. And frankly, another big reason standards adoption has been slow is that digital networks have slightly different rules for success than other ecosystems. One of them is that already successful social networks can easily be tapped by new ones to grow, at least if they’re open past a certain point. In other words, the services with the people in them already often don’t want to be connected to the services that don’t have them, no matter how good it might be for their users. To them, it can sometimes seem like a matter of survival not to support standards. There are also other reasons open standards for social business haven’t taken off, but in the end they just don’t matter that much. That’s because there’s a very important piece missing, and that piece is end-user demand for standards and interoperability. Unfortunately, we have only to look in the mirror for why this is the case. We are not requiring our providers of social media to support them, and especially, to enable them in a way that provides us the value we seek. This locks us in and forces us to lose control of our own information. We’ve forgotten the priceless lessons of the 1990s when application providers were routinely turned down by companies if they didn’t support standards. And it may even be too late to change this. Today the network effect of Facebook, Twitter, LinkedIn, and the whole host of other services is so large that they can’t really be ignored. Your companies and employees must use them, because everyone else does. And to be fair, almost all social network services, both consumer and corporate, support some of the open standards that are now common in social media: OpenSocial, Open Graph, Activity Streams, and to a lesser extent Pubsubhubbub, Portable Contacts, and the Salmon Protocol, to name some of the top candidates. However, for all these reasons, there simply isn’t critical mass in the social media industry today around open standards. Worse, there’s no consensus on how best to use them to achieve the larger benefits that are possible. Back in the era of blogs and wikis, we all had control of our own social media platforms. Certainly, the Web itself wouldn’t exist if we hadn’t defined and defended the standards that make it up. Nowadays, commercial providers provide everything in the cloud, including our friends and data, largely using their own technologies. This has led to the fragmented silos and social apps that increasingly isolate our digital activities into parochial conversational islands within our businesses and across the Web. There’s also good news though: There is a chance the horse may not be all the way out of the barn. If we are proactively as an industry, we might be able to better define and position open standards for social business, identifying the problem and the solutions we want to address with enough clarity that we can create consensus, and from there, achieve effective action. OpenSocial Foundation and W3C are combining forces to attempt to create a next generation of social standards. 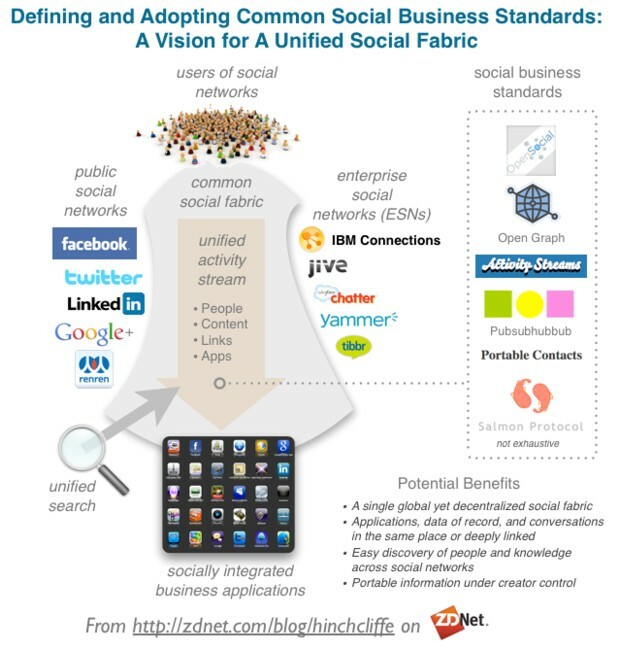 The intent is to describe a social business architecture to make sense of the currently heavily fragmented standards landscape around social media. It will have an emphasis on HTML5, making social media a “first-class” part of the underpinnings of the Web itself, something only the W3C has the credibility to do. Ensure that it’s grounded in real needs, the effort is use-case driven, with major vendors (IBM, SAP, Ford Motors, etc.) and start-ups (Crushpath) supporting. To begin this work, the W3C and OpenSocial Foundation are hosting a two-day workshop in San Francisco this August. This effort will be open to all that would like to participate. Titled the Workshop on Social Standards: The Future of Business, those that would like to participate should submit a position paper by the new deadline, July 7th. Details can be found on the workshop event site. I’ve repeatedly made the case for fundamental open standards in social business, as well as more sophisticated ‘higher-order’ standards over the years. Some standards have certainly arrived, both formal and de facto. Some adoption has occurred. We are getting closer to the day when social media may be far more standardized, automatically interoperable, and under our full control. However, and I can’t emphasize this enough, it’s up to us to make this happen by understanding how much is at stake (the future of the Social Web) and educating our colleagues and vendors. I am excited and hopeful that two top governing bodies have finally joined forces to see if the time is right to take open social business standards to the next level. I’ll continue to follow this story closely as it unfolds and report back as I can. Meanwhile, it’s your chance to learn and get involved. Are social silos holding back business results?